NIBBLE. Today is National Chip & Dip Day. Before you reach for the potato chips and onion dip, here are some suggestions for healthier chipping and dipping. Tortilla chips. Pick whole-grain tortilla chips. Salsa, the dip of choice, is low-calorie and healthy. Popcorn chips. 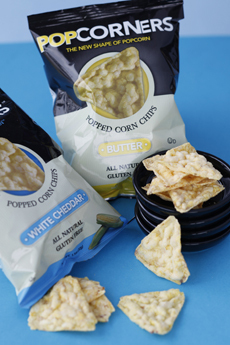 Pop Corners presses popcorn–a whole grain–into chip shapes. Popped potato chips. Popchips are a real find. They aren’t fried or baked – they’re popped. Delicious and nongreasy, they’re a keeper. Kettle Brand Chips. If you want a conventional potato chip, we love the Kettle Krinkle-Cut chips. Thick and very crunchy, they don’t break when dipping. Just about everyone loves crunchy snacks. The right chip is crunchy and good for you. Find more of our favorite snacks in our Gourmet Snacks Section. The history of tortilla chips. The history of potato chips.